Here we have a stunning pair of dark blue suede heels from L.K.BENNETT……a mid height (2 3/4” heel) court shoe style with a flat bow detail on the front - really lovely shoes! Size 39, a UK 6, and in excellent hardly worn condition! Sh oe s ar e in g oo d co nd it io n.
Marks And Spencer Shoes. Floral patterned, stiletto heel shoes. Worn only once, in really good condition. Comfortable extra wide shoes, heel on stiletto is in really good condition From a Smoke and pet free home. Dispatched with Royal Mail 2nd Class. Aldo Black Suede Leather Shoes 5.5 . Condition is Used. From Smoke and Pet Free Home Dispatched with Royal Mail 2nd Class. Pretty shoes in a lovely colour. In a boucle tweed style fabric in pink and black. Stiletto style heel. Buckle fastener on the t-bar. The heels, trim and bow detail are made of a contrast black patent leather. These are a really classy pair of point toe t-bar shoes. Dune Black Leather High Heels Size 39 / Size 6 - Excellent Condition, Worn Once! SMART AND COMFORTABLE. GENUINE LEATHER. However, in the past 7 years I have not had one late or missing parcel. I always try my best to help. And once you are happy, I'm happy. Classy shoe for an evening out or wedding. HOBBS PEEP TOE STILETTO HEELED SHOES SIZE 37.5. SMALL PATENT LEATHER PLATFORM SOLE AND PATENT HEELS. Lovely Faith navy blue faux patent pointed slip on court shoes with a stiletto heel. Ideal for wearing with dresses and suits that need a navy heel for weddings and formal occasions or for work. Size UK 6. Shoe is patent with suede edging and bow at front. Size 38 UK 5. Worn once for a wedding. Purple Patent Peep Toes Heels Size 9. My heel wearing are well and truly over, so clearing out. These are so flexible and comfortable, no issues. Lovely shoes to wear, sad to see all my heels go. Condition is Used. Dispatched with Royal Mail 2nd Class. LISA KAY London Black Patent Leather Heeled Shoes Size Uk 6 NEW. Dispatched with Royal Mail 2nd Class. 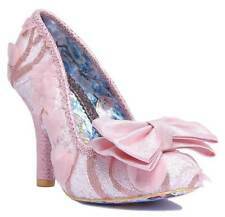 SHOES OPEN TOE WITH SPARKLEY FRONT WITH BOW. LOVELY PAIR OF EVENING WEAR BLACK LOTUS. ONLY USED ONCE FOR AN EVENING. IN GREAT CONDITION NO BOX. RRP £65.00 WHEN NEW. Hoyvoy Xti Ladies Patent Leather Royal Blue Heel Shoes Sz 6 39. Dispatched with Royal Mail 2nd Class. Stuning Ladies Shoes. Condition is Used. Dispatched with Royal Mail 2nd Class. Black office shoes size 7 with bow details . Dispatched with Royal Mail 2nd Class. Dorothy Perkins Pink Heels Size 4. Worn once for a wedding excellent condition cost £25 . Dispatched with Royal Mail 2nd Class. Gorgeous classy court shoes from Topshop. Worn a handful of times in an office so great condition as seen on photos. Please see my other items for sale. Stunning Rupert Sanderson court shoes - Vernice Nero - black patent - UK 36. Brand new, still in box. Slight shop damage to sole of right shoe. Dispatched with Royal Mail 1st Class. Shoes come up quite large, good for a UK size 4. Ladies Brown Leather Peep Toe Shoes By MARKS&SPENCER SIZE 6. Condition is Used. Dispatched with Royal Mail Signed For® 2nd Class. Ladies Silver Diamante Shoes. Would suit an evening out or special occasion. EU Size 40 or UK Size 6. BNWT M&S INSOLIA SUEDE COURT SHOES. SIZE 7.5 EUR 41. POINTED TOES. A Very Comfortable pair of Ladies Court Shoes with Low Ankle Strap Style, in BLACK Suede with Sewn Black Patent Trim. Features Sole Comfort Inners and Toe is semi Rounded. Heel is 2". Look very elegant on. BNWT Nine West Red Flagship Heels Suedette. Condition is New with box. Dispatched with Royal Mail 2nd Class.